Jon Boden is probably best known is the lead singer and main arranger of the progressive folk juggernaut Bellowhead. After twelve years, a quarter of a million album sales, seven singles on the BBC Radio 2 playlist and selling out hundreds of venues, including the Royal Albert Hall, Jon announced in 2015 that he wanted to move on. The rest of the band decided not to continue without him and Bellowhead played their final gig on May 1st 2016. As a total contrast to the eleven-piece Bellowhead, Jon launched his live solo career with a performance at Cambridge Folk Festival in July 2016. Jon’s recorded solo career goes back to 2006 with the album ‘Painted Lady’, followed by ‘Songs From The Floodplain’ - which led to him being named BBC Folk Awards Folk Singer of The Year 2009. Although Jon has toured several times since then with his band The Remnant Kings and as the duo Spiers and Boden, 2016 was the first time he performed entirely solo. He followed the festival launch with a solo tour, the response to which was over-whelming, with sold out shows and standing ovations. Jon Boden calls in at The Apex on 25 April, as part of the second leg of his ‘Afterglow’ album tour. The show incorporates elements from the wide creative span of his career to date –self-penned pop songs of Painted Lady, funked-up power-pop arrangements of folk songs that characterised Bellowhead, post-Apocalyptic song-worlds of ‘Songs From The Floodplain’, and unaccompanied ballads, as featured on his mammoth ‘A Folk Song A Day’ project. Widely respected as an interpreter of traditional song, the solo shows also showcase Jon’s instrumental talents on fiddle, guitar and concertina, as well as his trademark ‘stomp box’. Through his solo work and his work with Bellowhead and Spiers & Boden Jon has won eleven BBC Radio 2 Folk Awards. Jon Boden is at The Apex on Wednesday 25 April at 8pm. 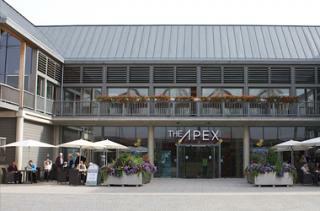 Tickets are £22, ring the box office on 01284 758000 or see www.theapex.co.uk for details.